HG Motorsports is once again taking part in the amazing traveling party that is goldRush Rally, now in its 8th event... Aptly named: GR8EST! We have a pair of sweet Porsches participating in the rally. One is Dan Wierck's Porsche 991 GT3 which we built during the holidays. That's the Deadpool car wrapped by KI Studios. Then there is Scottie's Super Street Cup 991 GT3, which you can't possibly miss because it's mint green with red accents. The wrap was done by Modern Image - It's the car on the cover... not like you didn't notice already. We'll be participating in the entire event from start to finish - including, of course, the track days. If you will be attending any of the stops, be sure to look us up and say hello. Driving for a good cause! Our good friend and customer @danwierck has partnered with Taylor Lynn Foundation for this year's goldRush Rally for a great cause! This year Taylor Lynn Foundation kicked it up a few notches for our annual mecca across the country participating on goldRush Rally (This year we are driving from Boston to LA, with 105 other participants). This is the most significant campaign they embark on raising considerable funds for children in need through their microGRANT program. In the past, they have had one or two cars participating to raise funds, spreading awareness for the cause. This year they have FIVE cars and an all new cast of characters, Super Heroes to be exact. The campaign this year is "Be a Hero". Yes, you can be a Hero to underprivileged kids by donating to your favorite car(s) and showing your support! You can donate to any car or cars you want. The funds are all going to the same amazing cause. But, we of course recommend Dan's Deadpool car. Here is the direct link to donate: www.taylorlynn.org/goldrush. Remember to select the DEADPOOL car. If you want to contribute a different amount than the limited selections from PayPal, you can go to the main donation page and specify any amount here: http://taylorlynn.org/donate/ (in the purpose section during checkout, type the car or cars you choose to support). For every $100 you contribute, you are entered for a chance to win the Arachnophobia from MB&F. 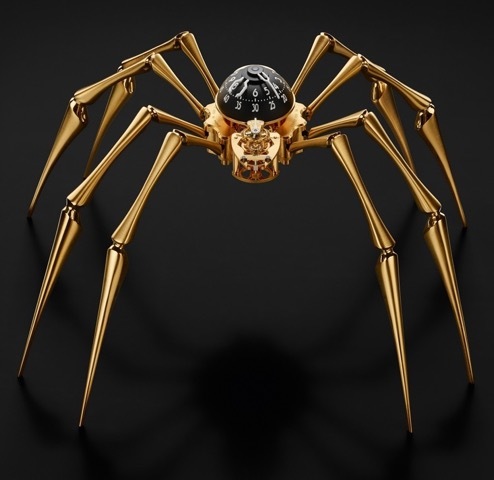 The Arachnophobia is by far the coolest clock you have ever seen. Yes, it is a clock, for a desk or even wall-mountable. It sells for $17,000, but you can enter to win it with a simple donation of $100. For every additional hundred dollars you donate, you’ll increase your chances to win.